My friend Aparna, of My Diverse Kitchen is hosting the Bread Baking Day #12- Small breads. What Aparna wants from usis to make anything like buns, rolls, biscuits, bagels, waffles, beignets, doughnuts, croissants, bread sticks, pretzels, etc. and we can make them sweet or savory, plain or stuffed, or add fruit/ vegetable/ nuts/ seeds/ herbs/ spices, etc. You can get creative and shape your bread decoratively. The sky’s the limit for possibilities. The only two things to keep in mind are that the bread should be “small” and should be made with a leavening agent. It’s not easy to bake with 40 degrees Centigrade but I began early in the morning with the air conditioning on, and then left straight to the Lake. Salt and pepper and other spices of your choice like paprika, cumin etc. Place flour, yeast, salt and sugar in a bowl and mix.Add olive oil and rub the oil to be absorbed by the flour and then gradually add water until the dough does not stick on the bowl or your fingers.If it is sticky keep adding flour until it is ready. Cover bowl with its lid and leave it for about ½ an hour to rise.When it is winter and it is cold add hot water in a baking tin and place the bowl covered with its lid, in the tin. Meantime, pit the olives and cut into small pieces and peel and grate the carrots. When the dough has risen knead it again a few times and divide the dough into two pieces.In the first one knead in the olives, oregano, rosemary, salt and pepper and in the other the carrot, coriander, garlic powder, salt and pepper. Make one roll out of each kind and twist them together. Cut each roll into slices of 2 cm. Line your baking tin with parchment paper and preheat oven at 180 degrees.Place the rolls in the tin and let them rise again.Bake for about 30 minutes.These turn out like little breads. One batch of the rolls I did not cut them into pieces but I dipped them in sesame seeds and baked them like usual bread.Then I cut them into slices and put them in the oven again and lowered the heat at 100 degrees and baked them for another half an hour.I turned the oven off and left them in the oven to cool down.These were like savoury rusks. Yumm Ivy! I love the combination of the olives and the carrot..great idea! 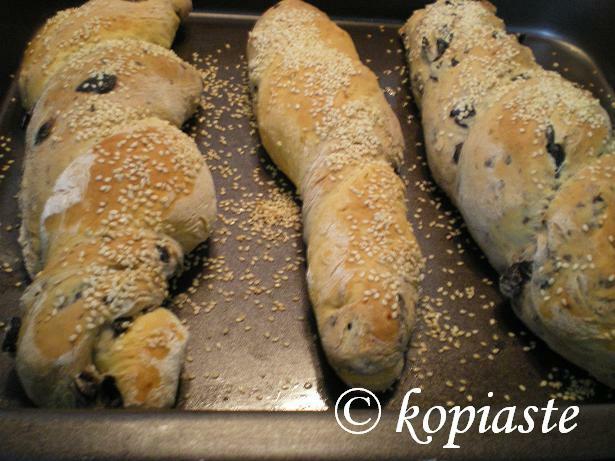 I see you made παξιμαδια!…the Greek ones are the best of course! Peter, when I first came to Greece olives were not used in breads or savory cakes as we used to make them in Cyprus but now I see that they are much appreciated. Wow Ivy, you are so daring! I can’t imagine how hot it got in your kitchen!!!! We are having a small rest from the heat now… nice temperatures :D. Sleeping without air conditioning is finally possible! I bet your bread was SUPER!!!! Nuria, welcome back. We had a few days around 35 degrees and now we are having a new heat wave again from tonight. Just lovely. I am a huge fan of olives. Exactly the type of savory snack I would enjoy. Interestingly, I am planning on making some scones with olives, feta cheese, and sun-dried tomatoes soon. Just got back from the store with the ingredients. We are on the same wave line. I can’t wait to see what you will prepare as I love anything with olives in it. Love these savoury snacks! And what a great way to get some carrots into my meals. Thanks for sharing this Ivy. Corinne, I know what you mean because I have a fear for baking but at least this is the simplest form of bread, no actual kneading is required, even if you mix the ingredients it will still work, so experiment with this one, you can’t go wrong. Deeba, it is really fun playing with the dough. Thanks for tagging me. I shall come over to see what I have to do. Lore, apart from the glorious carrot cake (which I love) you don’t get to see a lot of bread/cake recipes and I shall try and experiment more with carrots. indeed a very good recipe and healthy too ! thanks for sharing it ! one can never go wrong with carrots and olives ! One doesn’t usually see carrots in bread. Your bread sticks look plump and tempting. And love the different shapes of rolls. Thanks for the entry despite the heat. Here it is cooler now the rains have arrived. Thanks Aparna. We rarely see rain any more, even in the Winter. Thank you sunshinemom. Hope you’ll like them. Isn’t it fun to make up shapes with leftover dough. I’m glad I’m not the only one who does that. Hi Jude, it brings out the child in us.